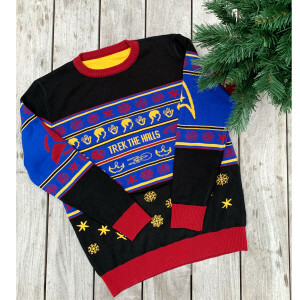 Get ready for the holiday season with the Star Trek Trek The Halls Holiday Sweater. This cozy "ugly" sweater is perfect to wear at your office parties, family parties, or hey, just wear it around your house; no one's judging. 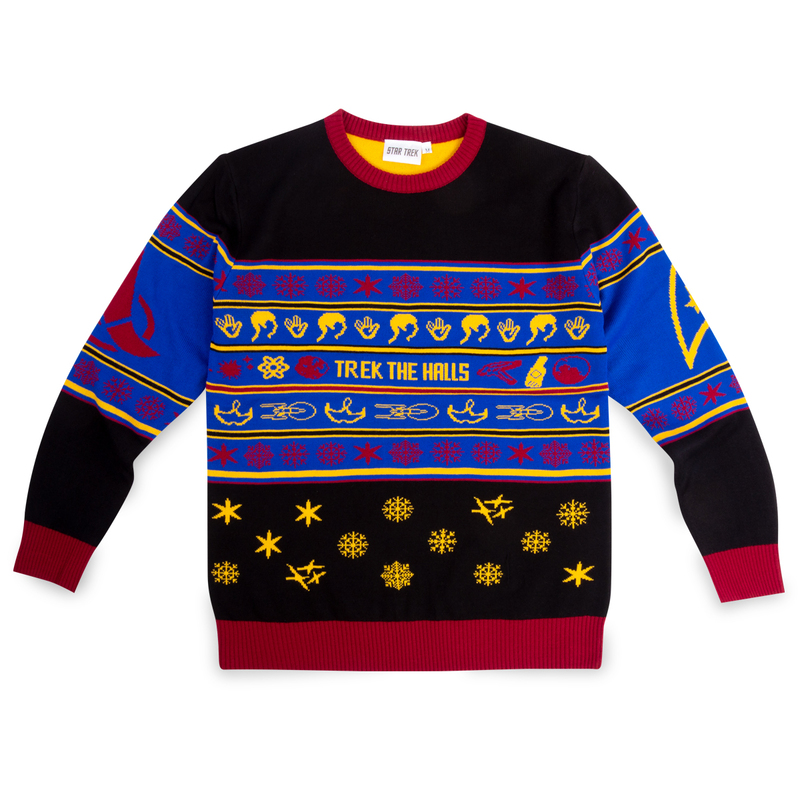 Featuring classic Star Trek icons, this sweater is great for any fan. Love the colors and the fit!! The designs are really cool too! Can’t wait for next xmas!!! *note that Canadians will pay a lot of duty on this. I paid nearly 50$ (Cad). Not Star Trek’s fault though, just be aware of this! And honestly, the sweater was worth it! My son, being a huge Trek fan, loves the sweater! He wore it on Christmas Eve with an extra sparkle and he said it was comfortable! Although pricey this was a great quality sweater. I agree that the colors were a bit darker than shown but still very nice. A word of caution however. I bought a 2XL for my hubby and it was cut so small he can’t wear it. I thought I was going to be safe since he typically wears an XL in dress sweaters but this one definitely runs small. The colors are a little darker than some of the pictures might lead you to believe--the red is more maroon, the yellow more golden-rod. But it's still an amazing sweater nonetheless. The materials feel very high quality! It is very well-made &amp; definitely a great conversation starter at parties! I ordered a medium (5'9" F, average build) and it had a perfect sweater fit that allows for layering! Great sweater. 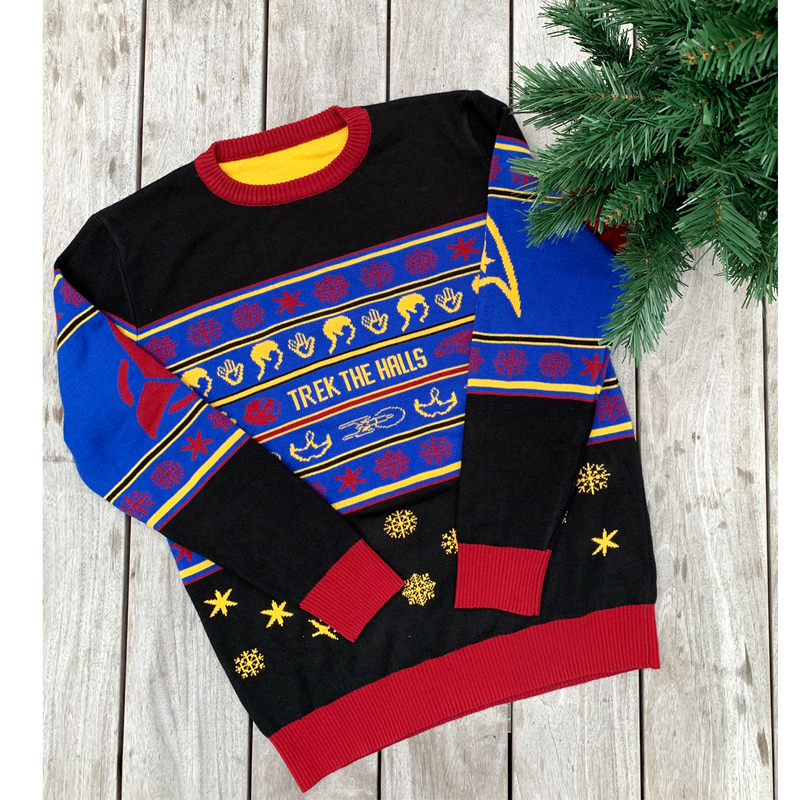 I'm proud to wear a sweater that says, "Trek the Halls"! It's well made &amp; warm. 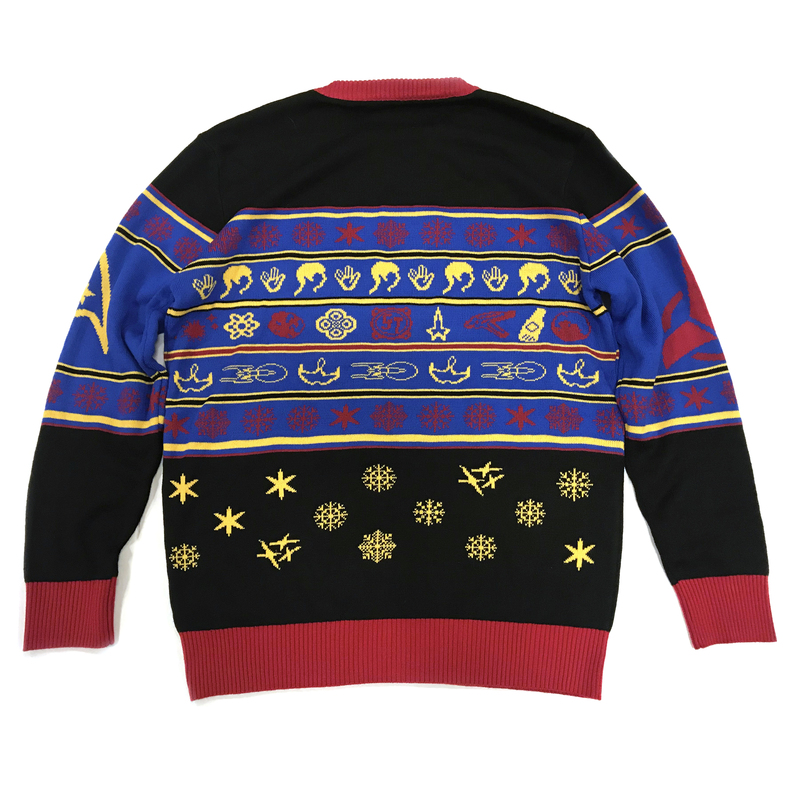 No more the ugly Christmas sweater, this is a ski sweater! Lovey, Well made &amp; ready for the holidays! Buy it! This is a wonderful "holiday ugly sweater" which is packed with Star Trek symbols. It was very popular at my company's Ugly Sweater Party. Great sweater! True to size, very clever pattern, and seems to be of decent quality. Well worth buying. This sweater runs small. My husband normally wears a large, but I bought an XL so it would be roomy. We got it, and it's snug on him. Other than that, its a great quality product.